Subject: LongIsland.com - Your Name sent you Event details of "Easter Sunday Brunch and Dinner"
Leave the stress of cooking and the dishes at home and come enjoy Easter Brunch with family and friends in our waterfront ballroom overlooking the lake! 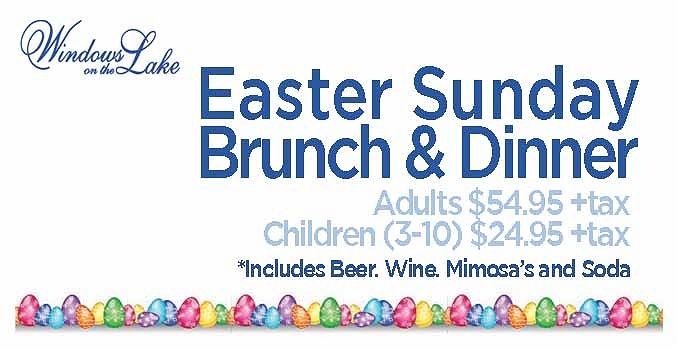 This Easter Brunch includes unlimited beer, wine and mimosas along with Our first seating starts at 10:30 am and the last seating is at 4:30 pm. Jut click on the link to view the Windows On The Lake full menu and to make online reservations. Or you can call us directly at 631-737-0088.